Educators in the Making Across the Curriculum project piloted Voice and Choice during a recent professional learning community, in which they redesigned elements of their school’s campus, including a set of stairs, a historic pathway, and a rainwater collection system, to better represent their own voices and the voices of their communities. Educator Praveen David and his colleagues in the Making Across the Curriculum Project used the Voice and Choice protocol to consider the missing voices and redesign a set of stairs to better represent their own perspectives, including the addition of an all-access ramp and a mural painted by students at the school. 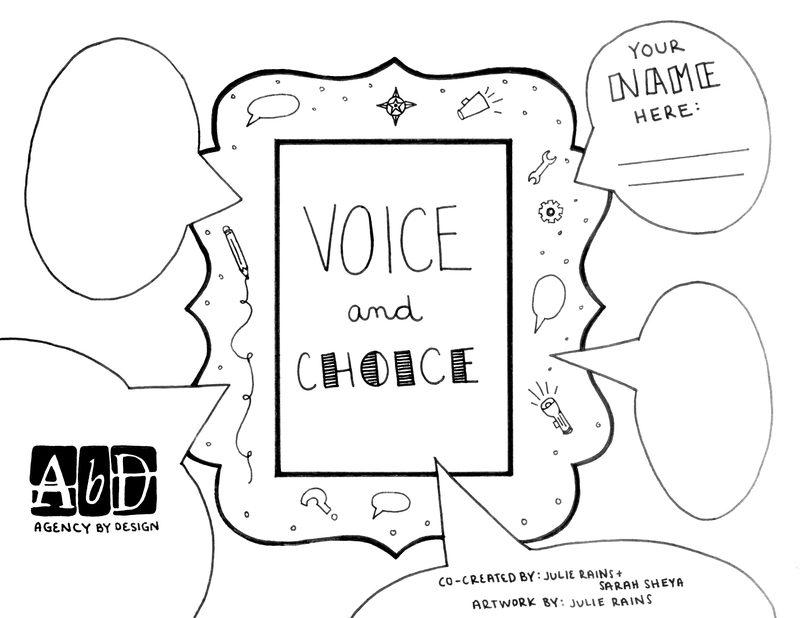 Educators have also piloted Voice and Choice in different classroom contexts. 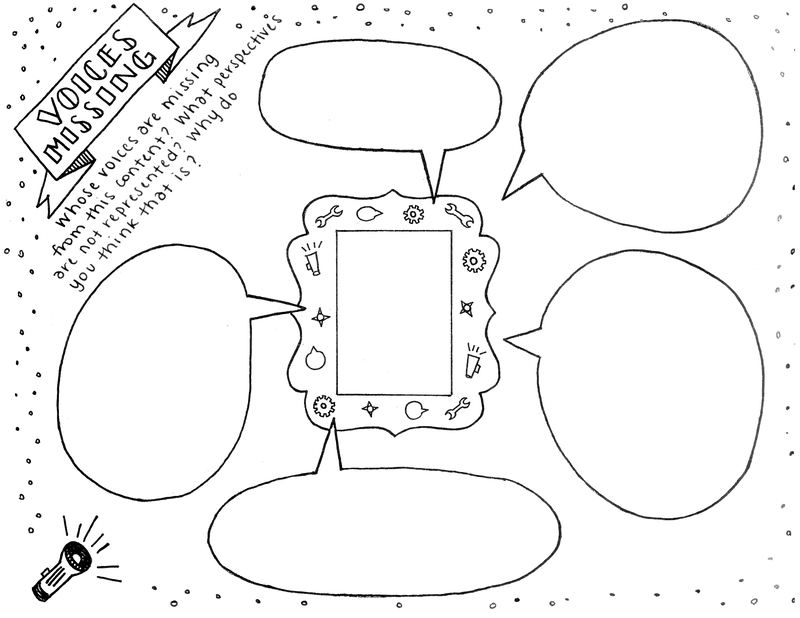 From high school students creating books of French poetry and redesigning book covers to fourth-graders creating a new set of doll clothes to represent “girl power,” students and educators are using the protocol to have meaningful conversations, ask critical questions, and get creative. After reading Paroles by Jacques Prévert, a surrealist French poet from the 1950s who writes about everyday life and denounces social injustices, students in Anne Leflot’s French literature class created their own books of poetry and redesigned the cover to represent their perspectives and what is meaningful/important to them. Piloting the tool, along with a series of conversations with educators Anne Leflot, Erik Lindemann, Fallon Plunkett, Julie Rains, Lisa Yokana, and Praveen David surfaced the role and importance of intentionality in the Voice and Choice protocol, which led to the development of the final two steps—Interact and Reflect. 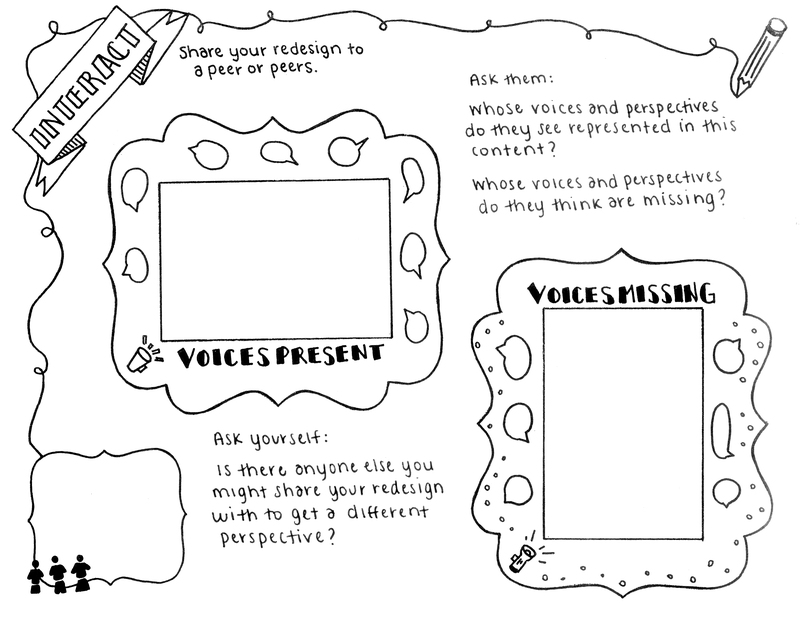 The interact and reflect steps of the Voice and Choice protocol offer learners opportunities to share their redesigned or reimagined content and encourage them to consider multiple perspectives. These steps also prompt learners to critically reflect on their own perspectives and how their design choices relate to those perspectives. In this way, learners can develop increased self-awareness and a sensitivity to design choices. Not only do they see their own perspectives shaping their interactions with—and reactions to—design, but they also recognize themselves as participants in the design process, able to reimagine, manipulate, and construct a new or different design that better reflects their own ideas, values, and perspectives. The protocol also provides an opportunity for learners to consider and enact intentionality. By questioning their intentions and expectations of their redesign, learners are supported to hone and articulate their own voices and stances. Future tools and practices will build off of Voice and Choice and the work of existing thinking routines like Parts, Perspectives, Me and Imagine if to continue to apply critical sensitivity and active redesign to objects and systems. Following the lead of our colleagues in Oakland, as we move this work forward some essential questions to consider are: How might the Agency by Design thinking routines and practices support young people to look closely at the intersections of power, oppression and representation? How might we apply maker-centered learning to actively and critically examine systems of oppression and power, with the intentions of disrupting and dismantling them? And of course, as we investigate and develop more tools and practices, it is important to look closely at our own design processes and continue to ask: whose perspectives are represented? Whose are missing? And, most importantly, why? A special thank you to educators Anne Leflot, Erik Lindemann, Fallon Plunkett, Lisa Yokana, and Praveen David for piloting the Voice and Choice protocol and sharing their learning with the Agency by Design team. A very special thank you to Julie Rains for all of her support thinking through the protocol and creating this Learner Workbook to accompany the new tool. This blog was published on October 17, 2018. Sheya is a researcher and Media Specialist on the Agency by Design Making Across the Curriculum project.